Scones are the easiest things in the world to bake tbh. This is a savoury twist on the delicious classic. Sage and onion is my favourite flavour of stuffing, which TBH means they should go with any Sunday Roast, but I especially love them at Christmas. It might be a little late to go shopping for the ingredients, but chances are you have most of them in already! I can absolutely recommend baking up a batch of these to have with your leftover turkey. 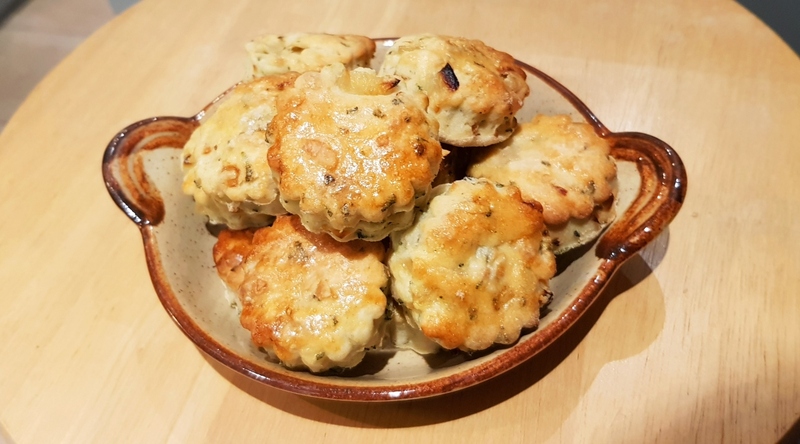 I recently made some to take into work for a fuddle (which is apparently a Yorkshire thing – it’s when everyone brings food into work to share). This recipe makes bucketloads of scones tbh, so don’t bother doubling the recipe like I usually do. Finely dice the onion then fry for 5 minutes until soft. Sift the flour into a bowl and rub the softened butter in until it resembles breadcrumbs. Mix in the sage and cooled onion. Work quickly now. Slowly stir in the milk until you have a nice smooth dough. Add a bit more flour if it gets too sticky. Knead the dough on a floured surface for a couple of minutes. Roll out until it’s about 1.5cm thick. Cut out in whatever size you like and place onto a floured baking sheet. Beat the egg and brush onto the tops of the scones. Serve with leftover turkey and cranberry sauce. What do you like doing with your Christmas leftovers?